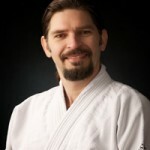 Adrian Iliescu started Aikido in 1991 in Bucharest, Romania. The style was influenced by Tadashi Abe through one of his students in France – sensei Daniel Andre Brun. Adrian began his practice under the direct instruction of sensei Cris Rusu and received instruction from senseis Dan Ionescu, Serban Derlogea and Ioan Grigorescu. In Romania participated at international seminars led by senseis Daniel Andre Brun and Rolf Brandt. Received his shodan degree in 1995. He started to teach Aikido in Romania in 1993. In 1998 he came to Canada, where he continued his Aikido practice with Cris Rusu. In 1999 he joined JCCC Aikikai. He received his Aikikai shodan in 1999 from shihan Yukio Kawahara and his nidan in 2004 from shihan Mitsunari Kanai.